As protests continue to spread throughout the eastern half of the island of New Guinea, where indigenous land rights have been suspended, an unprecedented mass mobilization has begun in the west, in the Indonesian-occupied state of West Papua. According to latest reports, as many as 20,000 Papuans have gathered in Jayapura to demand that Indonesia and the international community grant West Papua its lawful right to self-determination. The Indonesian government has been caught completely off-guard by the effort; nevertheless, they have so far shown remarkable restraint, especially given the long history of repression against anyone that speaks up for independence or dares to raise the Morning Star flag. Jacques Friedman, an independent reporter who has just returned from West Papua, has prepared a round-up of the latest news on the general strike. He has also written a background report on the situation, which you can download here. 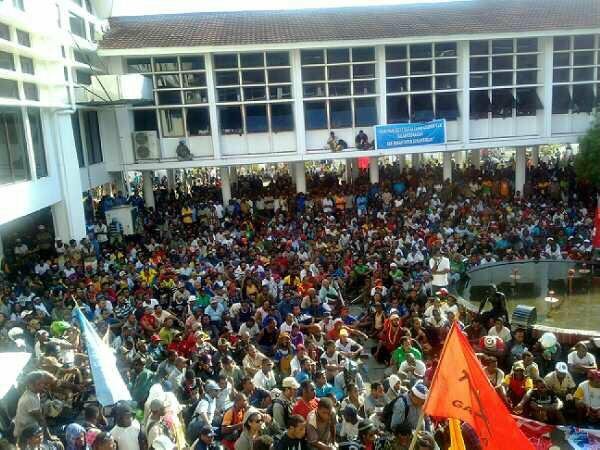 International news agencies have reported on the mass rally in Jayapura, capital of Indonesia’s Papua province. Thousands of people joined a long march, walking 17 km from the MRP (Majelis Rakyat Papua – Papua People’s Assembly) to the DPRP (Dewan Perwakilan Rakyat Papua – Papuan Provincial Legislature), rejecting the Special Autonomy granted by Indonesia in 2001 and demanding a referendum on West Papuan independence and an internationally-mediated dialogue with Jakarta. As protesters joined the rally from several points in the city, the crowd – claimed by media to number just a few thousand – swelled to nearly 20,000. They occupied the grounds of the provincial legislature under the watchful eye of police and army units. Papuan community media reported that Papuan provincial legislators were divided on how to deal with the rally and its demands. Legislators supportive of the MRP-sponsored declaration and the mass mobilizations backing it stated that there is a faction of legislators who oppose the movement and who were not present at the legislature for the planned special session. A group of legislators met with rally organizers FORDEM (Forum Demokrasi Rakyat Papua Bersatu – United Papuan People’s Democracy Forum) and stated that they must allow protesters to spend the night on the grounds of the legislature. Community organizers throughout Papua reported to their networks on the situation in the various regions. In Manokwari, police violently blocked the rally and dispersed protesters. In Merauke, over 1000 people marched to the regional legislature to present their demands, and rallied against the failure of Special Autonomy to protect indigenous people, particularly in regard to the planned 80 million-hectare Merauke Food Estate. In the highlands town of Wamena, shops and businesses closed as thousands rallied, denouncing Special Autonomy and calling for economic justice and self-sufficiency, and marched to the regional legislature. Organizer Yulianus Hisage stated that “we are demanding that the Papuan people’s sovereignty be restored”.